There are more than a hundred different stages in the manufacture of a crown or bridge in a laboratory, many of them both detailed and time-consuming, and all needing a very high level of skill and specialisation. Our in-house laboratory provides the highest standard of quality control available for our members. These are the restorations made in the mouth to repair damage caused by disease, dental decay, or breaks in the teeth. When the teeth have been prepared to remove decay and to shape a cavity to receive a filling, a soft material can be placed and sculpted to shape and then allowed to harden or caused to set, and then finished and polished. We use different materials for different purposes within the mouth. All of them are tooth-coloured. For fillings in back teeth, we use a new product that uses a unique chemistry. It is a microfilled composite material, and it is special because it has a very low setting shrinkage compared to conventional composites, less than 1%. This means that it does not tend to pull away from the tooth as it sets, and it stresses the toothless. In turn, that means stronger bond to the tooth and no after-pain from the restoration. For front teeth where appearance is the most important attribute, we use another product. Materials come in a wide range of shades to match to your natural tooth colour, and it is filled with clumps of nanoparticles of quartz rather than lumps of quartz itself. This keeps the material smoother as it wears over the years so that it keeps its high polish and continues to match to your tooth. All of these materials that we use have a very high level of adhesion to the tooth so that we need to cut away less tooth to achieve a good, long-lasting restoration for you. These are restorations that take too long for us to make in the mouth or which need processes such as firing in a furnace that has to be done remotely. 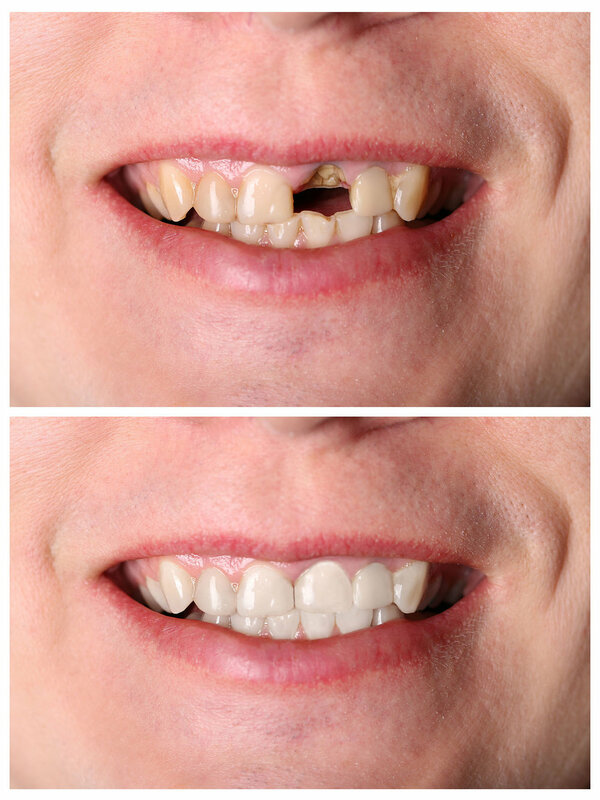 Such restorations include crowns, bridges, veneers, and inlays. Crowns are strong, long-lasting restorations that cover a whole tooth in order to restore its strength, its function, and its appearance. A bridge is a restoration that replaces a missing tooth or teeth, using your remaining natural teeth for support. It is a permanent restoration in that it is long-lasting and cannot be lost or removed from the mouth, being cleaned in place like your natural teeth. A veneer is a thin shell of porcelain made to fit over the front of a damaged or discoloured tooth to improve its appearance. Veneers are relatively quick to make and require less modification of the natural tooth. They are difficult and require great skill to make, but can have a much shorter life than a crown before they need to be replaced. Inlays are fillings for the teeth, made outside the mouth. They can be made of metal, white filling material, or porcelain, and they are brought to the mouth and cemented into the cavity. Become a member and benefit from our service.